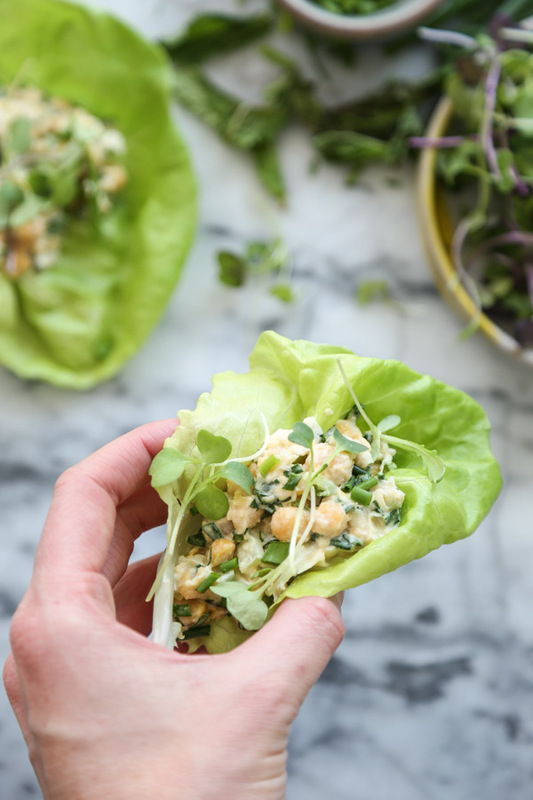 I had high hopes of getting these vegetarian chickpea salad wraps on the blog in time for Memorial Day picnicking. But then I arrived in Porto, had my first glass of vinho verde, followed by a very un-vegetarian pile of freshly cut jamon, and all of a sudden a week had flown by. Forgive me, I did what I could under the circumstances. Which was close to nothing involving a computer. The four days I spent in Lisbon after my friend’s magical Portuguese wedding in the north was the first stretch of time since Charlie and I started dating that I explored a foreign city all by myself. 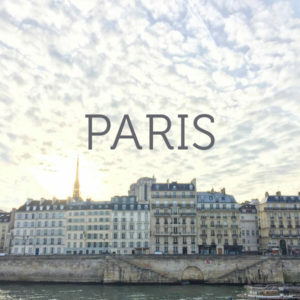 Solo travel has its perks and its drawbacks, so I was appropriately both looking forward to and dreading this stint of me time. The last solo adventure was this trip to San Sebastian in my mid-twenties, and the time before that was another two week stretch in Spain just after college graduation at age twenty-one. The contrasts between those two experiences had everything to do with age and budget. 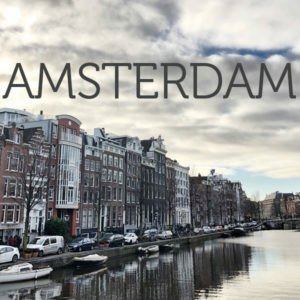 When I was 25, I was in travel tier limbo: too old to stay in the hostels I’d gotten so used to as a solo backpacker in college, and too young to afford anything nicer than the fleabag pensions I ended up staying in. What I hadn’t anticipated was how much I had relied on the communal nature of those former lodgings to supplement my social experiences on these trips. While it was amazing to do my own thing during the day, reading, beaching and sightseeing as much or as little as I wanted, I could at least rely on a gaggle of ex-pats with which to share tapas, sangria, and sweaty moments at da club after hours. In San Sebastian, I was forced to mostly pintxos hop on my own. Every night, I’d try to summon the courage to approach a stranger and introduce myself. But with each year of life, my aptitude for extrovertedness atrophies. It took until my last night in Spain to fight the anxiety for long enough to introduce myself to a pair of male Dutch field hockey players eating solomio in the corner of a bar. 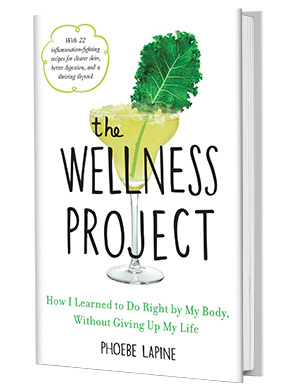 The night ended the way it had in my early twenties: with gin and tonics, sweaty moments at the club, and a refreshing partially-clothed dip in the Bay of Biscay. With five more years of life on the books, I knew that my sense of comfort would only be maintained by a cushy Airbnb, that I wasn’t interested in the sleep deprivation that nights at da club involve, and that my social anxiety would be too aggressive to even attempt making friends with strangers. So it was a relief when my paths crossed with old friends from New York, and a few new ones from the wedding who were also making their way down from Porto. I also was lucky enough to meet up with a local guide to give me the history of the city and share a few portions of fresh seafood with by the ports. I’ve got a full guide on what we ate coming to the blog soon, but suffice it to say it fell way more on the hedonism side of the spectrum. 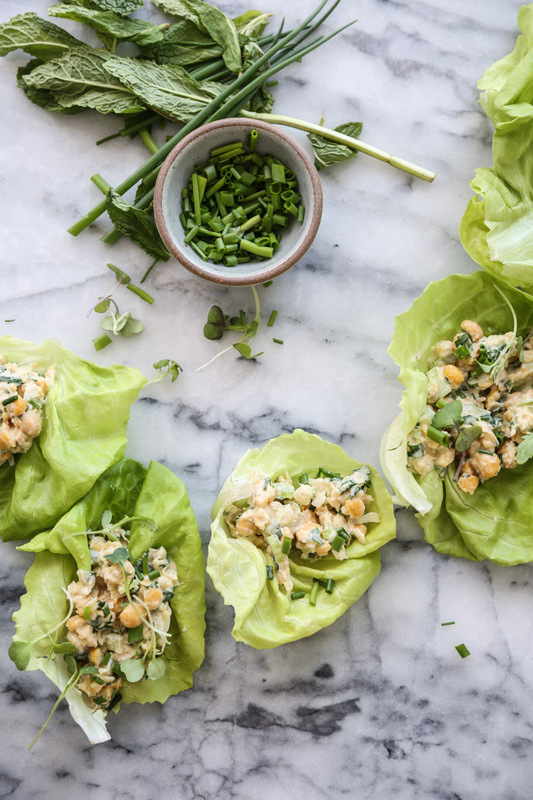 So, as the Jews say, the timing seems rather beshert after all that I saved these vegetarian chickpea salad lettuce wraps for my return, as they are exactly the kind of hearty bright planty bite I’m craving right now. 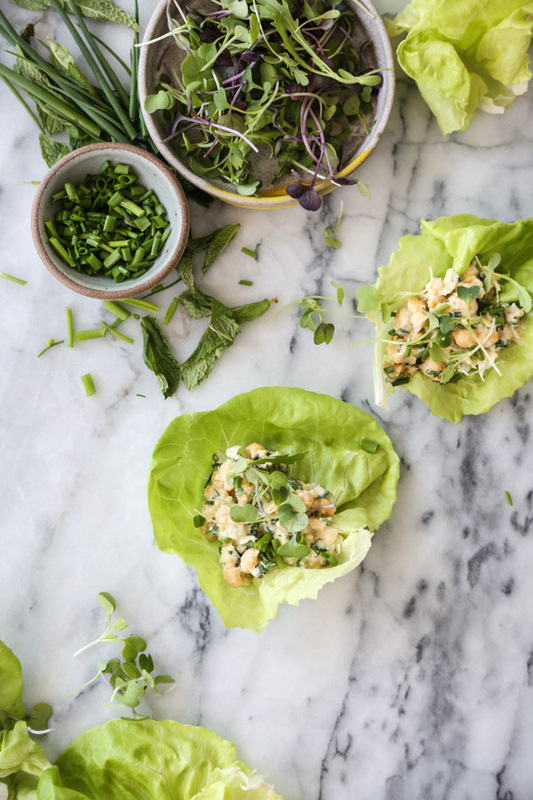 This brilliant recipe comes by way of the adorable Justin Chapple’s new book, Just Cook It! 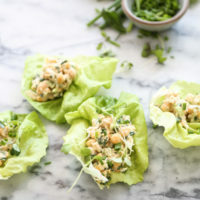 I dog-earred an embarrassing number of its pages, but ended up trying this healthy spin on a tuna salad wrap recipe as my first. 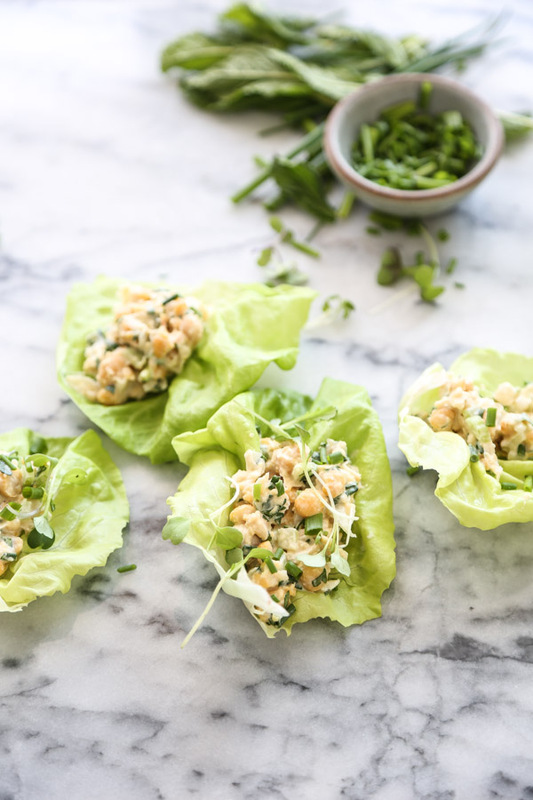 The smashed chickpeas are the perfect vehicle for fresh herbs, and snappy summer veggies. Each bite is silky smooth but with a refreshing crunch. I highly recommend you try it for your next summer lunch box or al fresco cocktail party. 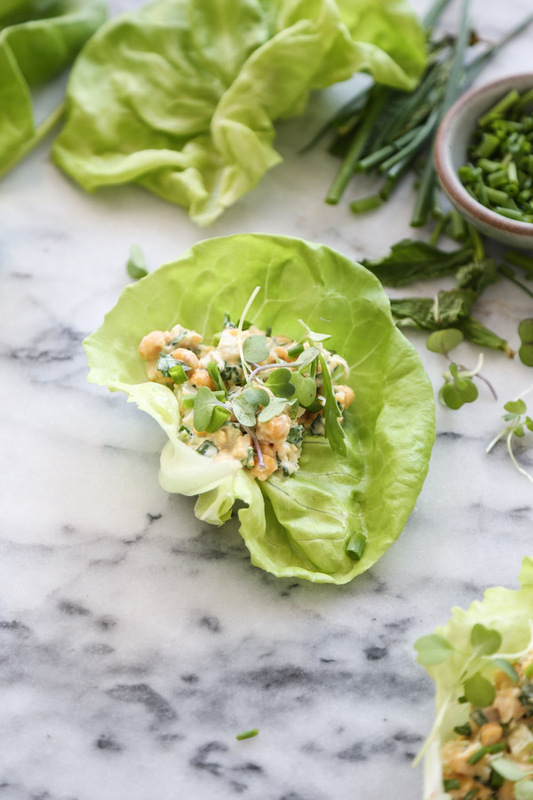 This chickpea salad wrap recipe is adapted from Justin Chapple's fabulous new book Just Cook It! I used a mixture of mint and cilantro in addition to parsley, and subbed scallions for red onion to make it slightly less FODMAP-y. The salad will keep in an airtight container in the fridge for a few days, but best to wait to stir in the herbs until before you eat. 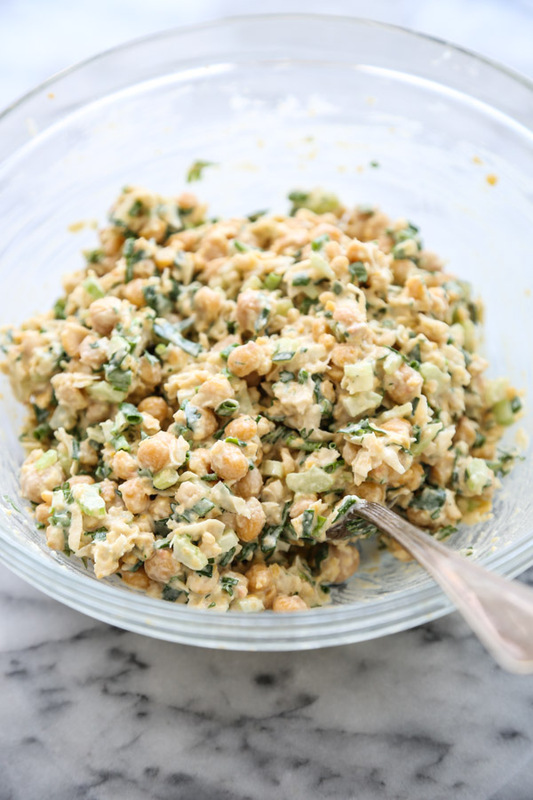 n a large bowl, using a potato masher or large whisk, coarsely smash most of the chickpeas (some of the chickpeas might still be whole, which is good). 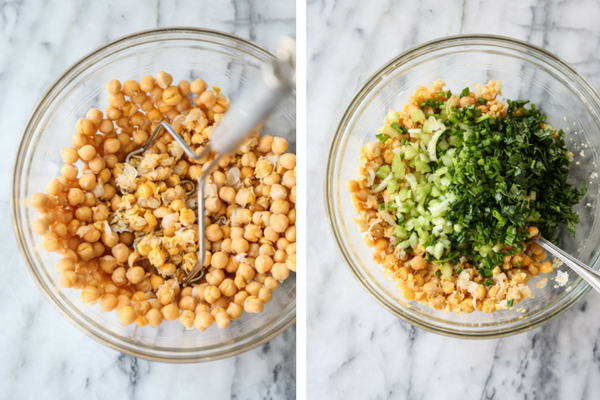 Add the celery, scallions or onion, mayo, and lemon juice to the chickpeas and mix well. Season generously with salt and pepper. Stir in the chives and the parsley. 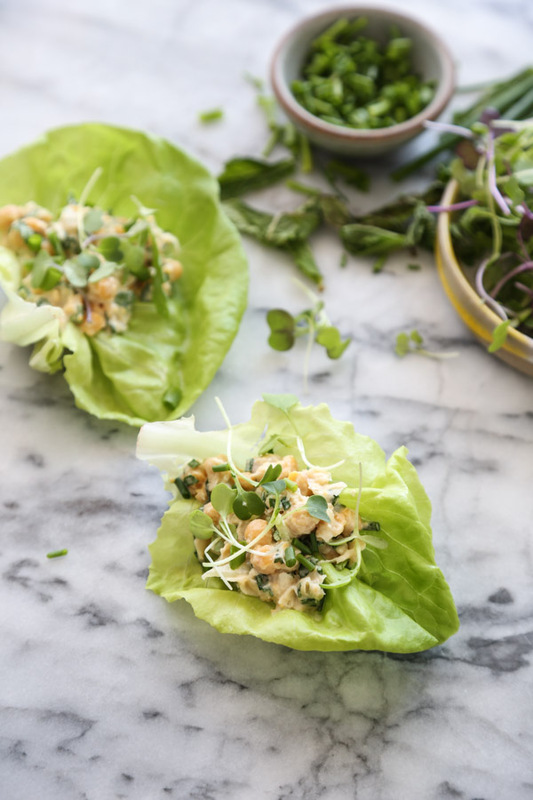 Spoon the chickpea salad into the lettuce leaves and serve. yes – radishes would be a great addition! Had high hopes for these but wasn’t keen. Way to much Parsley, so oniony and it’s missing something that I can’t put my finger on.